I live in Chicago, which means our home is wire pulled through conduit rather than Romex. I am trying to replace a single switched ceiling fan and I can't tell what all the wires are for. The old installation was a single switch that controlled the light and fan together, however, when I opened the box, there were extra wires that I think are meant to control the fan and light separately. I'd like to wire a double switch to the fan and light if I have the right wires already present. 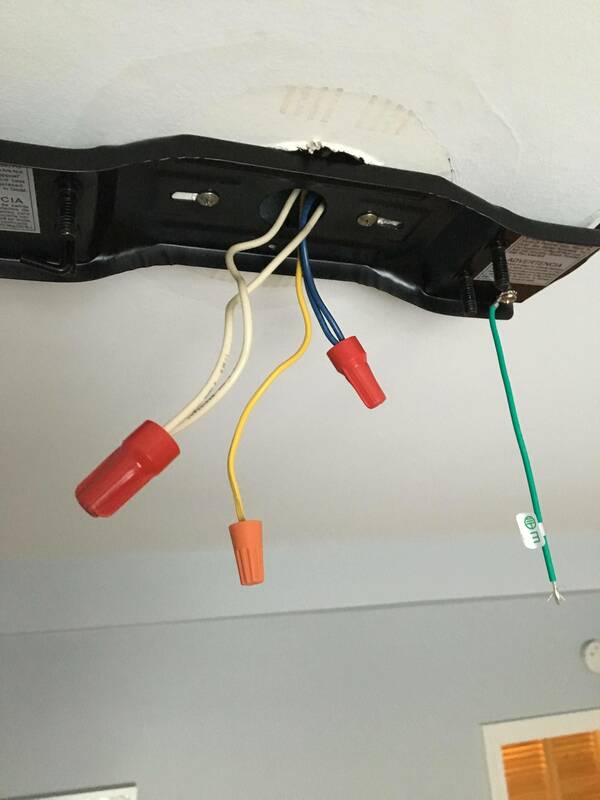 In the ceiling box where the fan is installed, there are: -one yellow wire attached to the fan and light wires -two neutral wires connected to the fan/light neutral wire -two blue wires nutted together in the ceiling box. 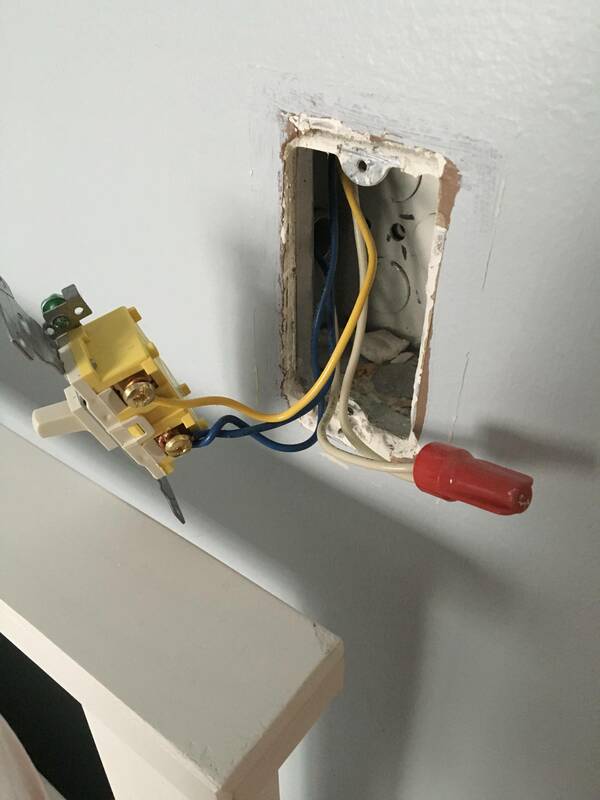 I am guessing the blue and white wires continue on to another fixture or outlet, but nothing else is connected to the switch in question. Any ideas what I am looking at? One of the wonderful things about conduit is you aren't restricted to standard NM wire colors (black/red/white), you have a rainbow to choose from (save for green, which is reserved for ground, and white or grey, which are reserved for neutrals). So, the electrician that put this in was smart, using yellow for the switched leg to distinguish it from the blue used for the always-hots. White, of course, is neutral then, which means there isn't a spare wire in there already for you to use. But that lack of a spare wire is no big deal! However, another wonderful thing about conduit is that it's possible to add more wires provided there's still acceptable space in there. Assuming that the conduit in the walls is half-inch (the smallest size you'd see used in a wall) and that the wires are 12AWG (the largest found on a lighting circuit), you get ~27mm2 of fill vs 78mm2 of usable space in a half-inch conduit. Adding a fourth wire to the conduit for the extra switched hot puts us at 36mm2 of fill, which is still no big deal. All in all -- installing a double switch here will be a bit challenging (you may wish an electrician as conduit pulling is a non-trivial exercise), but not nearly as troublesome as if it was wired using NM, where you'd have had to rip the cable clean out of the wall and put an entirely new cable in to get this job done. I see this as, the feed wires go to the Fan first, then drop to the switch, which then likely feeds something else (outlet?)... So blue is your hot, white is you common, yellow is your switched power. I'd pull the yellow out, but tie it to two new wires, one for light, other for fan. Not the answer you're looking for? Browse other questions tagged electrical wiring ceiling-fan or ask your own question.